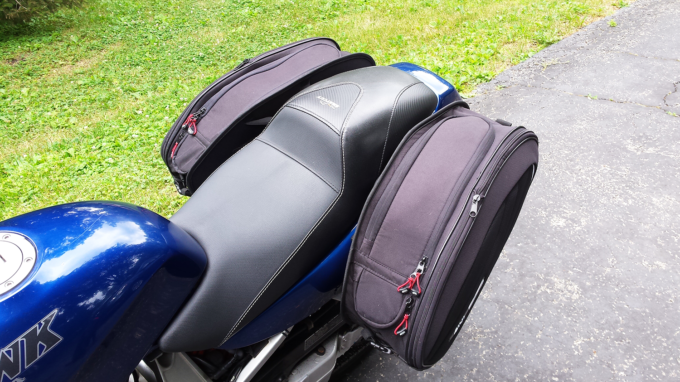 The headline above doesn’t aim to disrespect motorcycle luggage manufacturers. It merely acknowledges that they jump through a lot of hoops to provide us with safe and reliable products. Research and development is no easy road, so when designers arrive at a “universally compatible” result, I personally think a favorable nod is in order. There’s an unspoken truth behind soft luggage, though and it applies to motorcycling of all types (welcome, non-demographic cruisers). 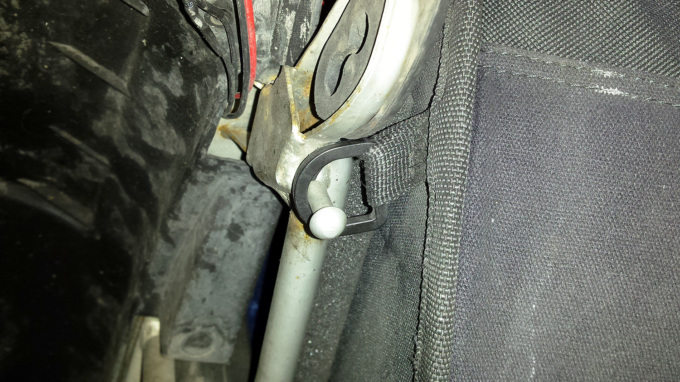 I’m of the opinion that the excessive fasteners included with every pair of soft bags I’ve ever owned are safe to remove once a rider finalizes their installation scheme … but companies can’t just say that. Instead, their instructions point to defaults that rarely fit more than one bike, mostly so that corporate insurance disclaimers aren’t responsible beyond said defaults. 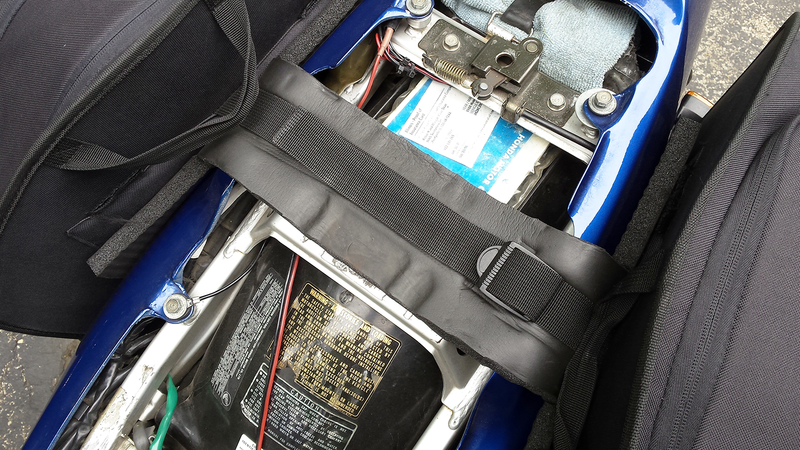 Our own Givi Easybags are top shelf as far as sportbike luggage is concerned, as are Nelson Rigg’s SPRT-50 series and Chase Harper’s thermoformed Stealths. The Givis include two large velcro cross straps that we’ve since removed, reducing the total textile support points to a single cross strap that runs under the seat. The thing is, it’s this “lesser” strap that’s more useful. 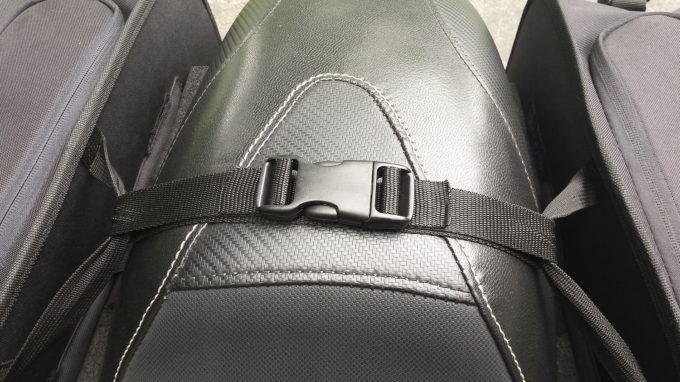 Over the seat, we’ve buckled a custom click-strap through the handle loops, summing six total secure points. 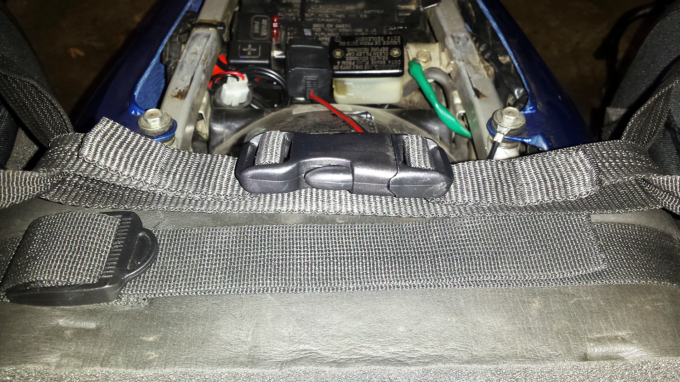 That’s one under the seat, another over, two lower/rear D-rings at the frame and two lower/front D-rings using additional hardware near the passenger footrests. I eventually realized that, because it’s adjustable, there’s no harm in putting our third-party click strap under the seat as well. This tightens up the overall look and feel of the bike while maintaining the same supportive strength. Aesthetics … check. 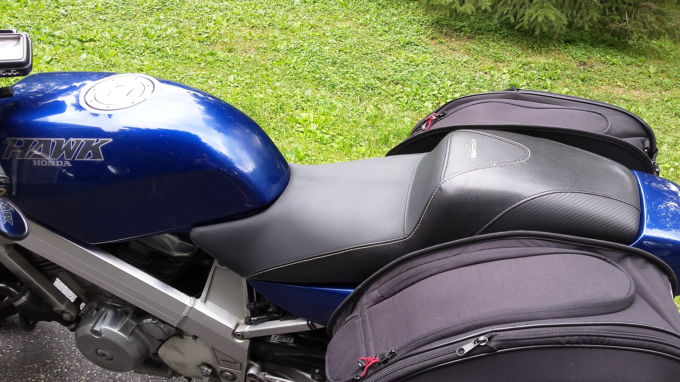 Originally intended for our Suzuki Bandit 1200, which we’ve since upgraded to a Twisted Throttle quick-release rig, our Givi EZ Bags now belong to an ’88 Honda Hawk GT, aka my wife’s ride, aka “Big Bird”, aka “The Vixen”. I tried a few different installation schemes before making a final decision. That’s the important part. 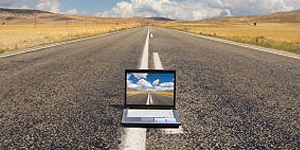 Test, test and test some more before deciding on your most promising, safety-minded modification. Some will require more straps than others. That’s the real trick … all of those straps. Each has a designated purpose but with so many different bikes on the market, each can be repurposed by ignoring plainly visible warnings against doing so. Kudos to the companies for noting this as it absolves them by insurance standards. As for the end user, adjusting your take on how to go about mounting said luggage can be greatly bettered if you use common sense and remain safety oriented. Assume the worst before doing your best to get what you want from their over-strapped mess. Poetry. 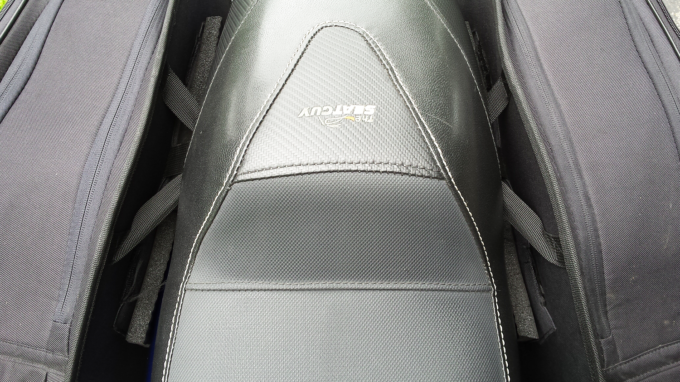 To protect the fiberglass cowling of our Hawk GT, I cut a custom “H” pad for both the bags and the under-seat strap to rest on from an old yoga mat. It proved perfect for keeping things both spongy and secure. Neoprene or some other dense foam might work as well. The particular details above only apply to our Hawk GT, however. Other bikes are likely to require a completely different approach. That’s the beauty of soft bag manufacturers over compensating with twenty straps for two bags and a “warranty void” warning. It insures you’ll find one or more good ways to mount them before ridding yourself of the excess spaghetti. Mmmmm … spaghetti. Have You Customized A Motorcycle Product Despite Voiding It’s Warranty? 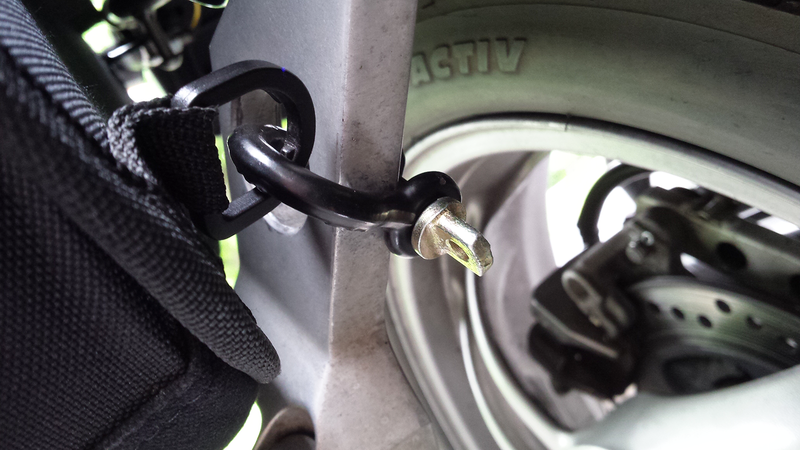 DIY adaptions are a regular occurrence in the world of motorcycling. What “edits” have you made? How have they helped and why? Your input is invited. Post an article!